I just posted part of my food blog on my Delaney’s Rant blog regarding how pleased I was that Wing n It has set up in Bay Roberts. Below is the full blog including my critique of my first visit during lunch service. Last March(2012) I visited my first Wing n it while visiting Gander, as a result, I wrote a positive food blog about my experience. While writing my post I couldn’t help but feel envious of the people of Gander for having this type of restaurant. 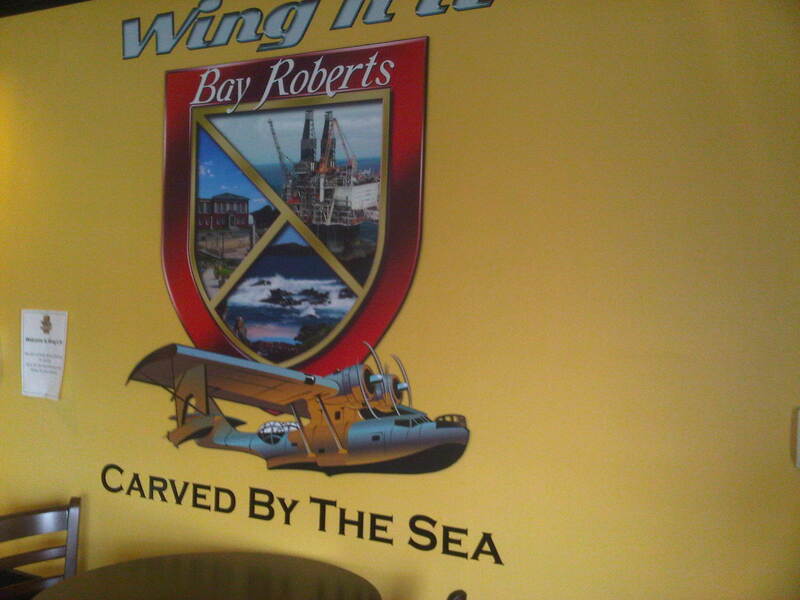 Little did I know that only a year later, Bay Roberts would have their very own Wing n It! For those of you who are not familiar with Wing n It, it is a restaurant primarily dedicated to wings, 93 flavors to be exact!! If you are a wing nut this is a great place to visit .The restaurant has now been open a few weeks and has held its own in the competitive market here in Bay Roberts. We have various eating establishments that are all worth the visit, but the addition of another sit down restaurant that serves great pub food fills a void that was only taken care of by Jungle Jim’s and Scrunchions (in season) in my opinion. Having a selection of restaurants, especially those that can make your meal into an evening out is great for a region who does like to eat out often. 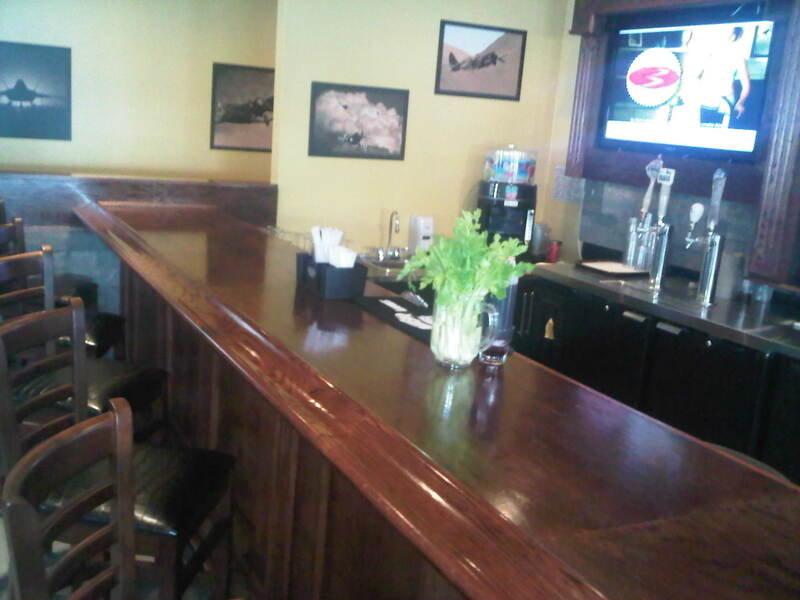 Wing in It Bay Roberts has a relaxing atmosphere and has a vibe that I like. I did appreciate that the owner renovated the building and gave it the “Wing n it” brand. It was very nice to see that they placed the town’s coat of arms on the wall with our new slogan. A great addition to the restaurant! The addition of the bar area and the TV monitors placed strategically around the bar shows great attention to detail and would indeed lure the patron to linger. I visited during the first week the restaurant opened so I do leave a margin for learning/error during this time. As stated above, the restaurant had its own feel which was welcomed. The server greeted politely and I was shown to a table to wait for the three colleagues who were to join me. I ordered the deep fried dill pickles while I was waiting as I was looking forward to them since I heard the restaurantwas going to open. I was hoping they were like the ones I had in Gander and not like the ones I had in St. John’s a few weeks before. I was not disappointed, they were crispy, firm (not over done) and very flavorful. One suggestion is that I would not order them for an individual appetizer as they can be filling and very rich. The sampler is a good way to go to try four flavors . We split the wing order between two persons each and ordered the sampler. The server had the task to come back and inform us that she had placed the order for boneless wings instead of the regular, which was a minor annoyance but it was the first week open. The order came quickly to the table and the flavor of the wings were very tasty and distinctive. The wings that I especially liked were the Amelia Earhart (honey garlic and roasted red pepper seasoning) The Red Barron (BBQ and Mac 3 sauce) they were tangy with a little kick for my taste buds. The wing flavor that I liked the most was the Sweet Baby Gezuz (Honey garlic and Kamikaze which is 5 stars) Firstly I loved the name and secondly I wanted to test my heat tolerance based on the restaurants star/heat rating. It was a nice slow building hot that mostly came after the wing was finished, this time I survived the heat!. Appetizer and wings were very well done. I could not find a on line menu currently from the website, but to help those who are looking, here is a snap shot of it, pardon the resolution I hope it helps. 2) that they claim to have 93 flavours when they really only have about 8 sauces and a half dozen dry spice but you can mix and match their flavors to create other flavours. Taking a generic BBQ sauce and mixing it with a generic Honey garlic sauce is not really a new flavour. You could ask the staff at jungle jims to do the same if you really wanted to. That said a lot of wing places use this method to expand their flavour list. But they use their own sauces, and also throw in unique flavours such as pizza sauce, alfredo sauce, and some places even use chocolate. 3) limited non-wing options. 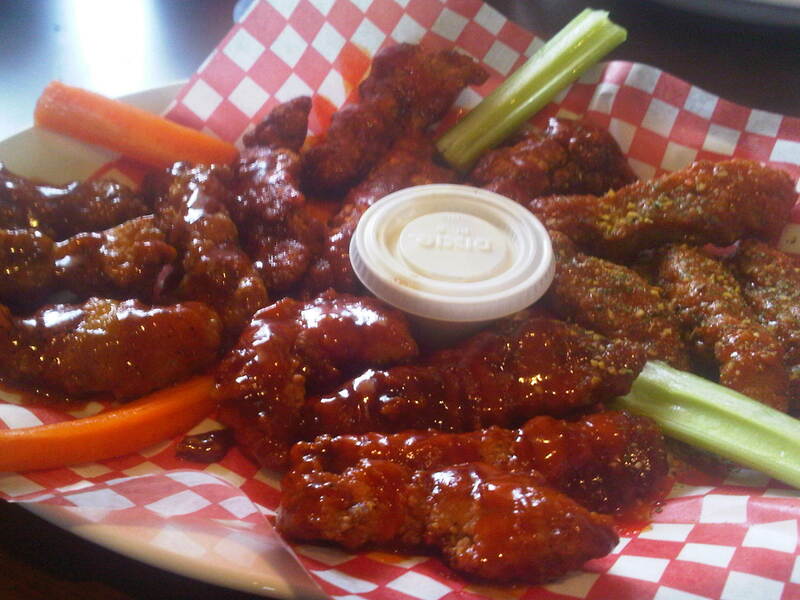 You know I`m a wing nut having eaten wings at over 100 places across Canada, but some people aren`t into them as much. So when getting a group of people together, if one or two aren`t wing lovers, then the group is going somewhere with more options. I`ve actually been part of conversations where 4-5 of us are deciding where to go and someone pipes up and says `not wingin it` fot that very reason. I love Wingin’ It. Congrats on getting one in Bay Roberts.